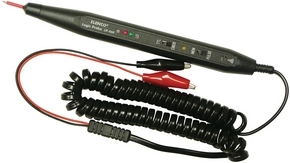 Hand-held digital logic probe provides convenient and precise use in the measurement of logic circuits. Displays logic levels (high or low); pulses and voltage transients down to 25 nanoseconds. High intensity LED readouts provide instant response to the logic state.